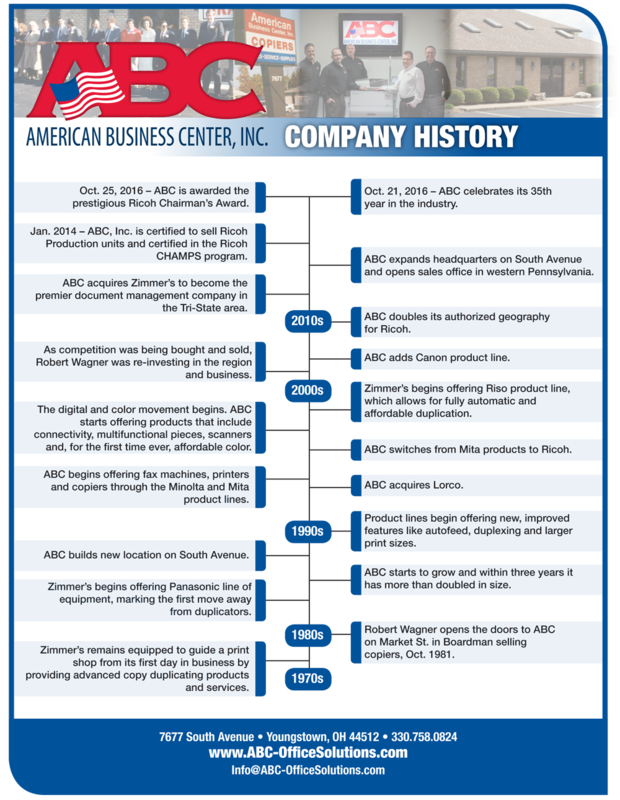 About - American Business Center, Inc.
American Business Center, Inc. has grown to be one of the leading office equipment providers in Ohio and Pennsylvania. We independently add emerging technologies such as wide format printers and next generation digital duplicators, along with specialized local service and support for a winning combination as your total solutions provider. American Business Center, Inc. will integrate the best solutions for you to leverage successfully, resulting in higher profit margins. From addressing your IT infrastructure to providing digital devices for optimum document management, we are the on-ramp to credible solutions for your document challenges today. We understand the changing demands of today’s office and serve each of our clients’ needs by enhancing their daily document workflow system. We focus on quality and value. Our professional team recommends and implements advanced software and reliable hardware to help our customers efficiently manage their business documents. We concentrate on understanding your company’s complete needs in order to fine tune solutions that will enable you easier copying, printing, faxing, scanning and archiving of documents. American Business Center, Inc. increases your company’s overall productivity and profitability, and finally, manageability! For detailed information call us at (330) 758-0824.